Here at the Swift Agency, just a Canadian guy who wants to wish all his american readers a happy and safe Thanksgiving, we traded the turkey for pizza. Thanksgiving for us already happened, it’s the second Monday in October. The Sparkly Dressed celebrated with her family but she had a few pre-recorded appearances lined up. 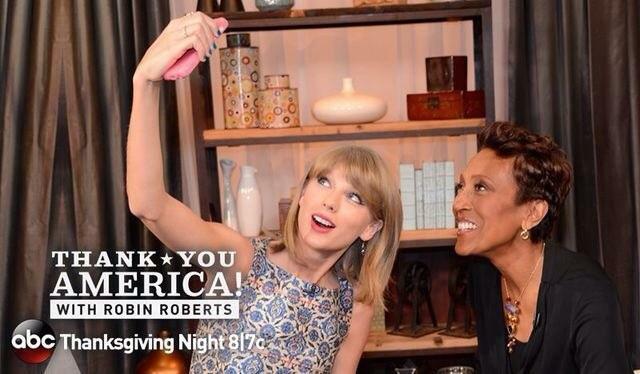 ABC just aired Robin Roberts’ Thank You, America special featuring this interview with the Forever and Always Fearless One. December 9: 2014 Victoria’s Secret Fashion Show. Previous Previous post: Live With Kelly and Michael, Lorde and New Year’s Rockin’ Eve promo!